Member of the Chinese National Wushu Team. Placed first in Long Fist and third All-Around. 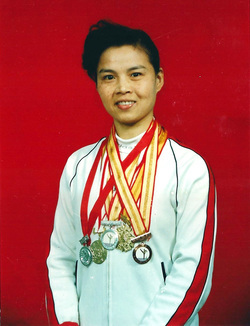 Member of the Historic 1974 Chinese National Wushu Team. Invited to the U.S. to perform for President Nixon at the White House. ​Member of the Chinese National Wushu Team. ​Invited to the U.K to perform for Queen Elizabeth II as part of an international tour. ​Won first place in wushu sword and second place in Yang Style Tai Chi at the Chinese National Competition in Bamon City, Mongolia. ​Won second place in Yang Style Tai Chi and Wushu Double Swords and third place in Wushu Partner Fighting routines at the All-China National Competition in Changsha City, Hunan. ​Member of the Chinese National Wushu Team. Honored as the Most Popular Team Member on the team's international tour. ​Won second place in Yang Style Tai Chi and Wushu Traditional Double Spear routine at the All-China National Competition in Kunming City, Yunnan. ​Attended Shanghai Sports College. Served as wushu and tai chi coach at the school. ​Member of the committee that created the Chinese National Competition Standards and Rules for Tai Chi. Won first place in Sun Style Taijiquan and second place in Taijijian at the All-China National Competition in Taiyuen City, Shanxi. ​Member of the Chinese National Wushu Team. Won first place in Sun Style Taijiquan and second place in Taijijian at the All-China National Competition in Wuhan City, Hubei. ​Member of the first Chinese National Tai Chi Team. Won first place in Sun Style Taijiquan at the First China-Japan Tai Chi Competition. Member of the Chinese National Wushu Team. ​Filmed by the Chinese Wushu Research Institute demonstrating the Sun Style Taijiquan competition routine. ​Emigrated to the U.S. Granted a "Person of Extraordinary Ability" visa. ​Collaborated with Master Jou Tsung Hwa at the Tai Chi Farm in Warwick, NY. Received Oustanding Achievement Award and Awarded "A Top World Level" by the International Wushu Association in Beijing. ​Basic Movements of Tai Chi Chuan instructional video received The Communication Awards for excellence in communication. ​Awarded 8th Duan from the International Wushu Shanshou Dao Association. Recognized as one of the Top 100 Martial Artists in the World by the World Culture Science Academe in Hong Kong.